Gavin Clarkson (seen center) has announced his run for the 2020 U.S. Senate seat. ALBUQUERQUE, N.M. (KRQE) - A former Trump official is joining New Mexico's race for U.S. Senate. 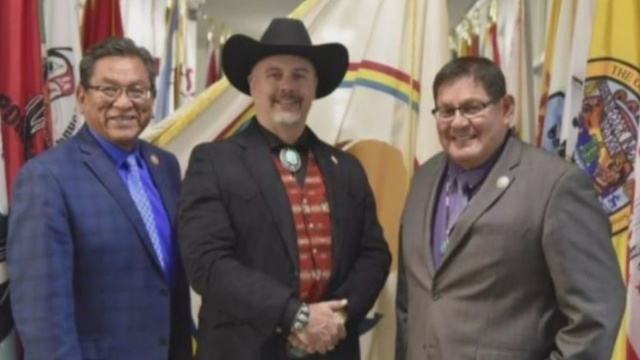 Gavin Clarkson was named a senior official in the Bureau of Indian Affairs last year but later resigned. The Republican announced he will seek Sen. Tom Udall's seat after Udall decided not to pursue reelection. Clarkson has previously lost bids for the second Congressional district seat and secretary of state. According to the Albuquerque Journal, Clarkson was an associate professor in New Mexico State University's College of Business and following his leave of absence to serve in President Trump's administration, filed a lawsuit against the college accusing them of wrongful termination. Democratic Rep. Ben Ray Lujan is also running. Secretary of State Maggie Toulouse Oliver also says she's considering a run.